Story: Sprutten is an octopus having fun at the beach and in the ocean. 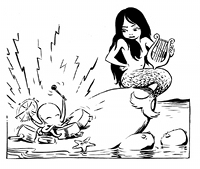 Background notes: Henning Dahl Mikkelsen (Mik) became famous for his creation Ferd'nand, but besides his work on that series, he also experimented with other ideas. 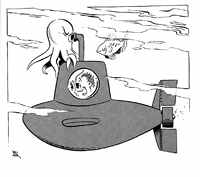 One of them was the octopus Sprutten (the word sprutte is an abbreviation of the Danish word blæksprutte which is squids and octopi). 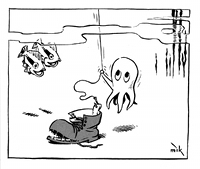 Mik only made a few pages with the octopus, and the comic would have been forgotten if not for his son Eric Dahl Mikkelsen (emik) and the Danish cartoonist Lars Jakobsen. 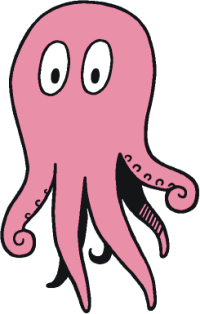 Jakobsen and emik took the idea and made a series of new pages about the small octopus, which they published along with the original material in a small comic book called Sprutten from 2000. No additional material with Sprutten has been published so far.